I was very excited to hear about Chroma Squad. Upon hearing about its Kickstarter success my level of hype was too much contain. I love strategy titles, especially ones with high customization. Not to mention, as a kid, I was massively into Power Rangers. Needless to say, a lot of dreams came true when Chroma Squad was created. I voted for it immediately on Steam Greenlight, and it has finally been released. Long story short, I am so glad this game was made. You play as a group of actors trying to make it big in the world of Super Sentai television shows. Your original job hits a snag with creative direction, and the actors decide to make their own show. However, your old director will not let things go and slaps you with a lawsuit. Not only do you have to juggle pleasing fans with your growing show, but you have to make the correct decisions when it comes to the ongoing IP legal battle. The story is a brilliant mix of satire, 4th Wall Destroying, and predictable fun. I found it to be pretty original given the satire/parody of Power Rangers. Experiencing the story is just one reason to play Chroma Squad. Since you are creating your own show, you choose everything from the actors, to their colors/outfits, weapons, skills, and even the giant robot parts. It doesn’t stop there – set design and upgrades will also be chosen to increase production quality. While the actual design is not chosen by the player, it is applied through upgrades bought by the player with money earned from episodes aired. The game flow is very simple. Buy set/unit upgrades, play an episode (mission), buy more things, finish out the season, win game. The combat is turn-based grid RPG. You move your team first, attacking enemies in range and completing the episode’s objectives to earn more fans. Then the enemy takes their turn, and so on. Your units will have varying skills that determine their role and their weapons will also reflect that. Probably the most fun part about combat is how it is presented. You start the episode in street clothes, then you must gain enough audience hype (after all, Chroma Squad is filmed in front of a live studio audience). From there you get to Chromatize, which is this game’s version of “Morphin’ Time”. Skills and stats change when in this mode as well as the outfits. Later in the game you will basically start every fight with this active. While some could view it as being a bit overpowered, many of the missions involve you being incredibly outnumbered so starting in your powered up form is not exactly an advantage. It levels the playing field. Customizing your robot suit is a bit of a challenge to make it look nice, but also be combat efficient. It doesn’t help that all of it is made from items dropped from enemies. There’s no shortage of crafting in Chroma Squad. After all, you have to build everything yourself. Lesser items will be refined into better items to create better weapons and armor. The crafting is simple, but the drop rates seem a bit unfair. Buying the materials quickly drains your account, so you can’t upgrade your studio. Learning the balance between everything takes time, and you might not get the hang of it during your first season. Chroma Squad‘s game flow is predictable, but fun. It doesn’t do anything revolutionary with their combat and gameplay mechanics, but it takes the best parts from other games and uses them well. The pixel art is a modest touch combined with natural humor that doesn’t feel forced. 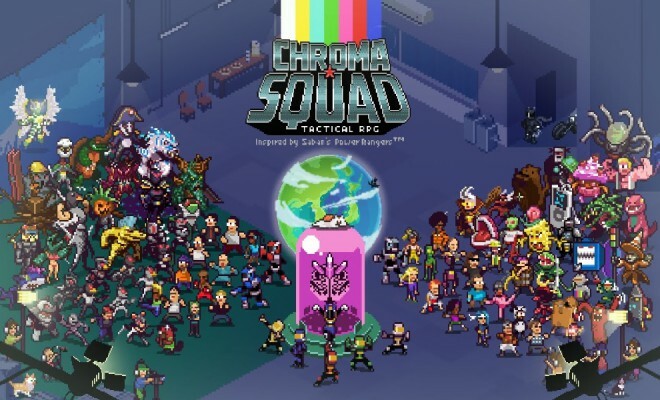 There’s a lot of fun to be had with Chroma Squad for strategy game enthusiasts. But I encourage everyone to buy this game pronto.